The Salem Gift Certificate is redeemed like a check. A business receiving the gift certificate simply deposits the certificate like any other check. The money is in an account, maintained by the Chamber, and funded by the original purchase of the gift certificate. If a customer uses only a portion of the Salem Gift Certificate, the recipient can give back cash or a credit. Either way, businesses that receive the Salem Gift Certificate will get the full value of the check. 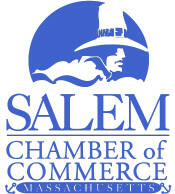 To participate in the program, businesses must be members of the Salem Chamber of Commerce. To sign up, simply contact the Salem Chamber. Gift Checks are available in $10 or $25 denominations You may purchase these at the Salem Chamber office at 265 Essex Street, Salem, MA 01970 or if you would like to order these by phone please call 978-744-0004. For any other questions and inquiries, please contact the Chamber by phone 978-744-0004, or e-mail: info@salem-chamber.org.